Here it is — my first macaron video tutorial! This is a new recipe that isn’t in my book. It’s recommended for people who love chocolate and cherries! * Line 3 baking sheets with parchment paper or a silicone mat. If the baking sheets are thin, double them up. Macarons are sensitive to heat so they need to be baked on a durable tray that has lots of insulation. You’ll also need a pastry/piping bag with a large round tip ready before you begin. * In a stainless steel or glass bowl, beat the egg whites until foamy like a bubble bath before adding the salt. Then add granulated sugar in 3 batches. Start at a low speed and gradually increase the speed. When finished, the mixture should have stiff peaks. Add color. * Pipe the batter onto the parchment or silicone mat. * Bake for about 15-20 minutes. The tops should be firm and glossy and the bottoms of the shells should have formed “feet” or frills at the bottom. The risen macarons should be firm with the slightest amount of give. If it wobbles, they require another minute or so. When done, the cookies can easily be removed from the parchment or mat. Mix the butter in a bowl for about 30 seconds, and then add half the powdered sugar. When the mixture is smooth, add the chopped Morello cherries and juice. Then add the remaining powdered sugar. Add color and mix another minute or two. Put cream in microwave for about one minute until hot — NOT boiling. 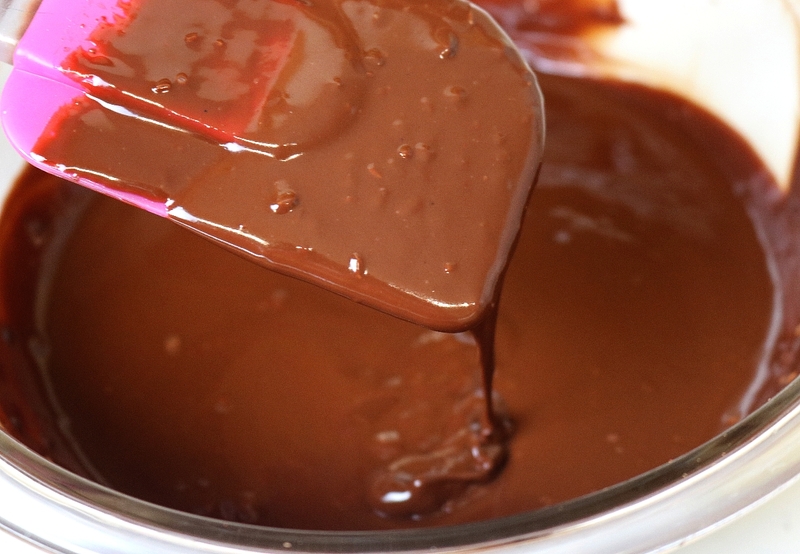 Pour over chocolate chunks. When melted add almond extract and whisk well until smooth. Let sit at room temperature for at least four hours or overnight. Cover with plastic wrap. Use a spatula to scoop the ganache into a piping bag with large 4B open star tip. French Macaron Baking Adventures, Part 18: March is Macaron Month! Springtime and macarons – what a beautiful combination! . Since 2005, Jour du Macaron has been celebrated. Noted pastry chef and macaron expert, Pierre Herme, came up with the idea in order to bring attention to this lovely French delicacy and raise money for his charity. Usually, Macaron Day is held on the first day of spring. However, this year when I Googled the holiday, I was given three different dates. So, why not celebrate macarons for 31 days this March? I’m inviting anyone who bakes and sells their macarons — whether online or anywhere in the world! 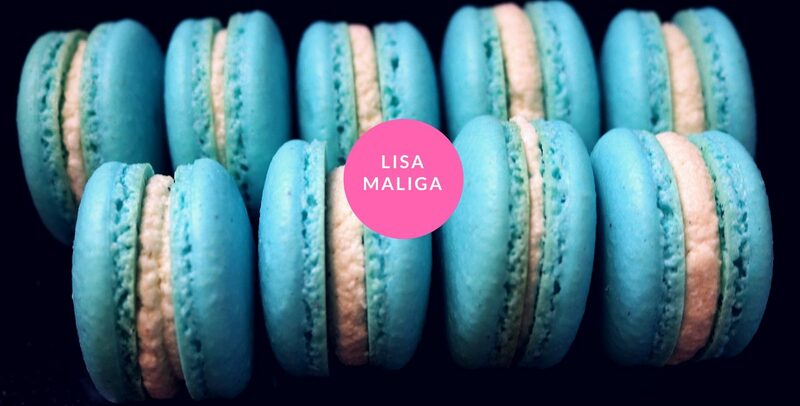 — to let readers know you’re celebrating Macaron Month! Just leave your information in the “leave a reply” box below. I encourage you to share the blog post with others. Let’s let people know where you are and if you’ll be celebrating the official Macaron Day or Macaron Month. FOR READERS & MACARON BAKERS! Watch my blog for updates, as within the next 30-45 days I’ll be releasing another dessert cookbook. 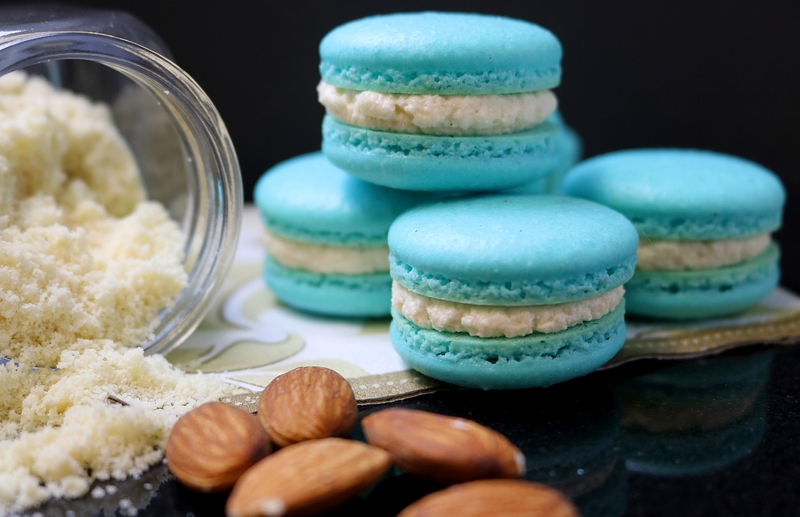 Here’s a photo of my Almond Macarons which I baked last month. The recipe will be included in my forthcoming book. If you subscribe to my newsletter, you’ll be notified of the book’s release before anyone else! Blackberry buttercream is purple but the shells aren’t! I’ve got the blackberry macaron blues. I’ve tried twice and both times the shell color isn’t blue, isn’t purple, isn’t black. I wanted “Purple Rain” colored macarons. I love that color. I love that Prince was fond of royal purple. The bottle of gel colorant is that hue. But the results are quite different. I got the purple buttercream that I wanted. However, by using a violet mica colorant, the shells aren’t purple. Mica colorants are used for soap crafting but the ingredients aren’t harmful as they’re derived from minerals. I was doing this as an experiment and there were no negative results — just a lack of purple! The purple mica has a sheen to it—which is what makes the soap sparkle a bit but won’t do that to a macaron shell. For my second attempt I used a purple gel colorant for the shells. After separating my egg whites and placing them on the counter to age overnight, I emptied out the piping bag with the purple buttercream filling into a mixing bowl. The blackberry jam tasted no different from the strawberry jam I used in my first buttercream. I figured adding fresh blackberries would change the taste. All I did was cook the blackberries in a tiny bit of water and mash up the berries. Then I strained them, poured the seedless remainders into the buttercream, and mixed it with a mixer for several minutes. It was loosely incorporated. But 24 hours later you can see how it’s separating. The resulting mess looks curdled but it’s not. This time the fresh blackberries can be tasted. But the macarons are messy to eat! The above photo shows drops of blackberry juice. Maybe someone can use this idea for Halloween if you want a blood theme, just use fresh blackberries–or raspberries! Next week I’ll test a fantastic new fruity macaron recipe and a brand new type of colorant! Win free books and a box of macarons! Time to try the metric system! I used my trusty little digital scale that I bought for soap crafting. It only measures up to six pounds but does grams and ounces. I’m a fan of vanilla as I don’t think it’s plain. Vanilla’s a spice, it comes from an orchid and grows in the tropics. It’s not white, it’s black. And I finally tried vanilla bean paste. I highly recommend it. I used Nielsen-Massey vanilla bean paste because I wanted the tiny seeds and didn’t have to scrape them out of a vanilla pod. I was also curious to try the paste, as I’d read several online reviews from bakers of all levels of expertise citing it was very flavorful. According to the Neilsen-Massey website: “Due to its thick consistency, similar to molasses, this culinary paste enables you to add more delicious vanilla flavor without thinning out your batters or sauces. It’s also ideal for recipes, such as crème brûlée and ice cream, in which you want to add the enticing visual flair of vanilla seeds.” As macaron batter can be finicky, I didn’t want to take a chance in adding vanilla extract and I wanted the vanilla seeds. Win win! Now, I was supposed to precisely weigh the ingredients but the three eggs didn’t weigh 110 grams but 88 grams. I figured I’d take a chance and I’m glad I did because this batch turned out fine. In fact, by using three rather than two eggs, I ended up with 53 shells. Since I had so much batter, I used a silicone mat on top of two warped cookie sheets. I’d read not to use warped cookie sheets but it didn’t make a difference—the shells came out just fine. So fine that they were effortlessly removed from both parchment and silicone surfaces! That was another first. What’s as good as a macaron with feet? Shells that don’t have to be scraped off with a spatula! When I added the vanilla bean paste right after the blue gel colorant, the black seeds were apparent and the blue changed to mint green. After sitting in the fridge overnight, the shells returned to robin’s egg blue again! I used up the rest of the strawberry buttercream filling and also used more of the lemon curd buttercream which had been double bagged and stored in the freezer. NOTE: Click links for recipes! TIPS: Sift the almond flour three  times before you make the macarons. The fourth time is when you blend it with the confectioners’ sugar. This is why macarons average $2.00 each – they are labor intensive. 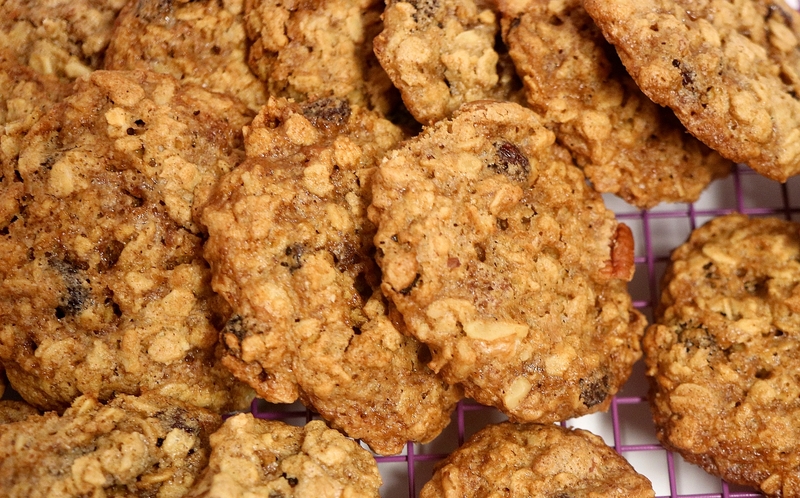 Patience is needed for crafting these fancy French cookies. Sifting almond flour isn’t tons of fun but the more you sift, the smoother and shinier your finished macarons will be. [Check out the one to your left]. * Bake for 12 minutes. The tops should be firm and glossy and the bottoms of the shells should have formed “feet” or frills at the bottom. 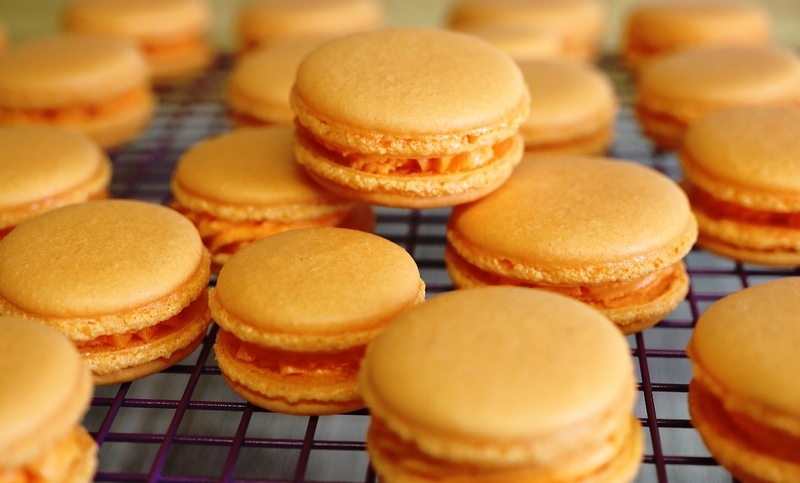 The risen macarons should be firm with the slightest amount of give. If it wobbles, they require another minute or so. When done, the cookies can easily be removed from the parchment. 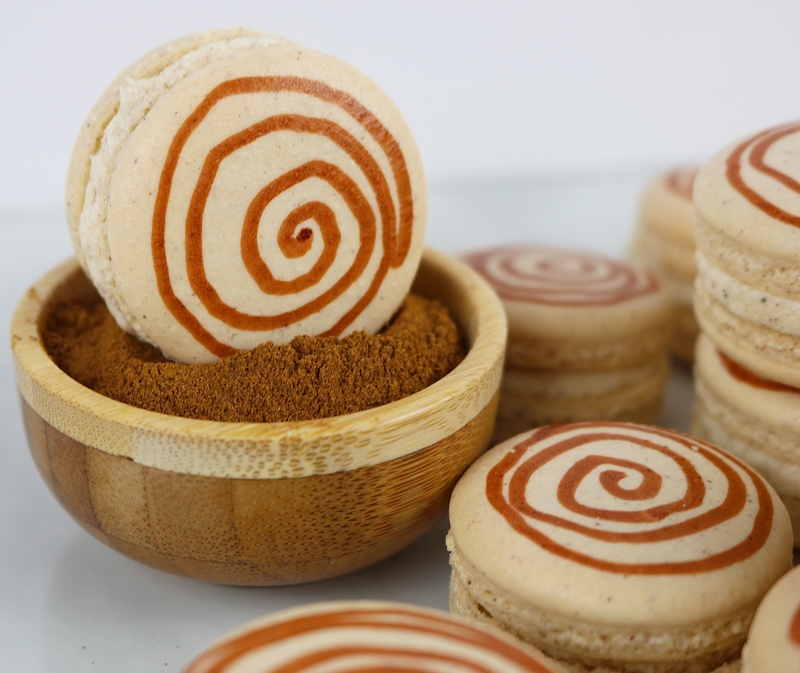 Learn to bake macarons! Baking French Macarons: A Beginner’s Guide is available in eBook and paperback editions! Win free books and a book about baking macarons! Love, Valentine’s Day, Macarons, and … Murder? Yolanda Carter is preparing for Valentine’s Day as romance and macarons are baking in Yolanda’s Yummery. But things take a dark turn when the body of someone she knows is found dead in a nearby dumpster. Teaming up with Detective Winston Churchill to find the killer, some employees are suspects, including Yolanda’s boyfriend, Nigel Garvey. A February 14 appearance on the TV show, America’s Best Bakeries, and the yummery’s upcoming first anniversary are overshadowed as she strives to run her business and help the detective. Macarons of Love also contains recipes for French macarons and cupcakes. As the sun had finally shown its rays and brightened the day, she was about to return to the kitchen when the front door opened. There stood a handsome young man in his mid-twenties wearing an elegant hunter green jacket and tan corduroys. He beamed upon seeing her and she noticed that he was the one to initiate the first move by rushing across the store and behind the counter, where he greeted her with a big hug and kissed her gently on the lips. She felt the strong attraction and stared into his penetrating dark eyes. Beneath the light of the shelving units filled with bagged and boxed sweets, she saw that his natural golden brown wavy hair had more gold than brown. He had been in Miami for three days, which explained the difference. “I missed you, Nigel,” she said as a way of greeting her boyfriend. What I wish my macs resembled! The macaron baking saga continues as I want to test the King Arthur “super finely ground” almond flour I’d found for a dollar less at Walmart. I also wanted to try a strawberry buttercream filling because I love strawberries and the idea of a buttercream filling seemed decadent to me. I’d written about them in my books but in fact had never made buttercream frosting/filling from scratch. I’ve used containers of Duncan Hines and Betty Crocker frosting. Well, they weren’t actually buttercream, they were called frosting, had a long shelf life, were always at room temperature, and were spread with a knife. At least in my experience they were. 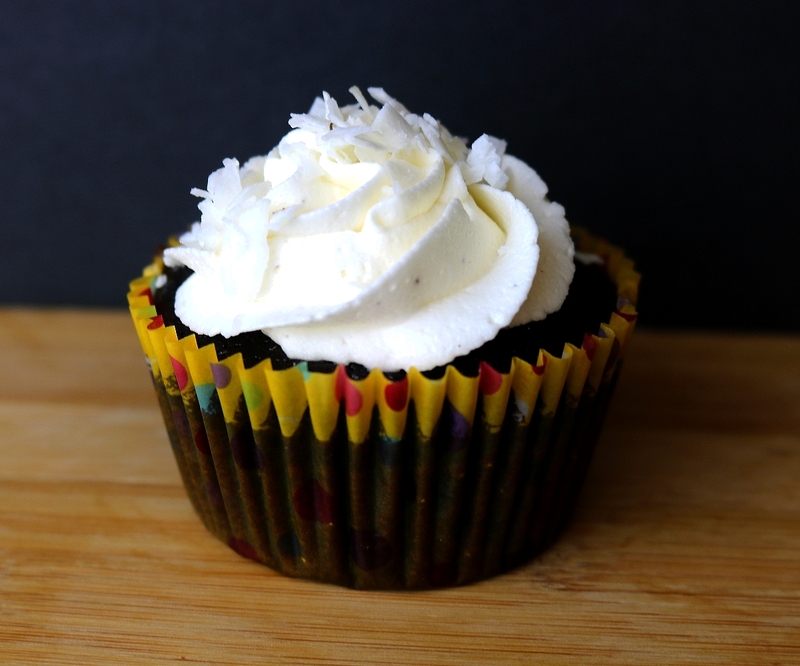 While all frostings or buttercreams contain high amounts of sugar, the store-bought variety had vegetable shortening instead of butter so they didn’t contain butter or cream. At first, I thought the super finely ground almond flour only needed to be sifted with the powdered sugar. Wrong! I ended up sifting it twice. I left the two eggs out overnight, thinking I’d separate them before I made the macarons. When separating the whites from the yolks, some of the yolk dropped into the egg white bowl. 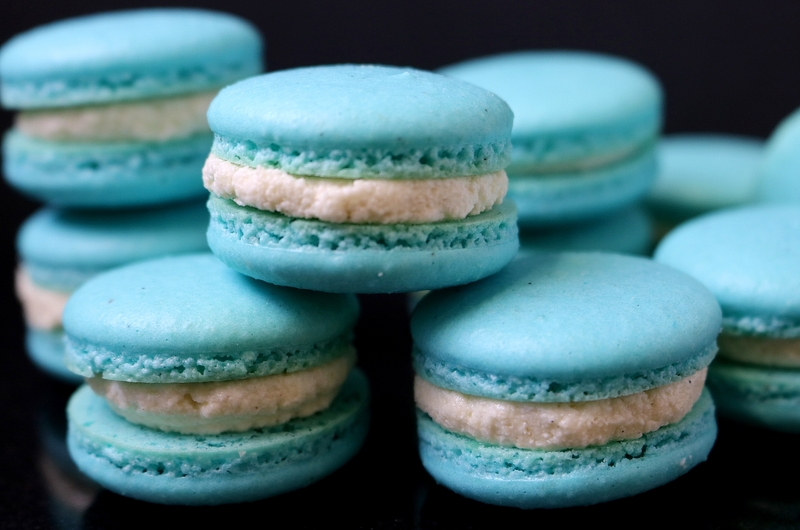 Macaron baking experts declared that a NO as fat wasn’t good for macs. So I scrounged around online until I found a website where the author claimed an egg could be aged in the microwave for ten seconds. Most eggs contain a high percentage of water in the whites. When aged, extra water evaporates. Separate the white from the yolk and cover with cling wrap with a small slit to allow for evaporation, then place in the refrigerator for 24-36 hours. You can also leave it out overnight or for about 12 hours if the bowl is covered with a paper towel. The eggs must be room temperature if you want them to whip into a fluffy meringue. Strawberry buttercream filling–a piping bag’s eye view! I want to emphasize the importance of using the best and highest quality ingredients in your buttercream filling as you will taste them! If you can use fresh strawberries or strawberry jam/spread that you’ve made, that would be excellent. I used a fruit spread that was sweetened with natural fruit juice and fruit pectin. There are many high quality types available in your grocery store, health food store, farmers market, etc. that DON’T contain high fructose corn syrup. Here’s a list of preferred ingredients: strawberries, sugar, cane sugar, concentrated lemon juice, and fruit pectin. INSTRUCTIONS: If using a stand mixer, add the butter to the bowl and mix for about 30 seconds, and then add half the powdered sugar. If using a hand mixer, make sure you have a LARGE bowl and mix the butter first, then add half the sugar. When the mixture is smooth, add your wet ingredients: cream, jam and vanilla. Once mixed, it’s time to add the remaining powdered sugar. The mixture should be smooth and firm but not too firm that it would crush the delicate macaron shells. If you pipe onto the shells, it’s recommended that you use a large, plain tip, Wilton size 10. Start by piping in the center and doing a swirl until you reach near the edges but not right at the edges. 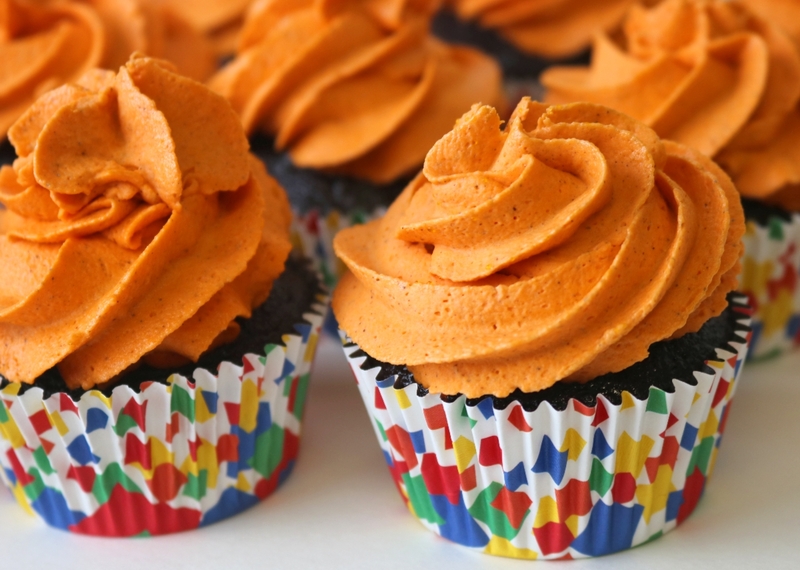 You don’t want to overfill them and make a mess with leaking buttercream filling. Gently adding the top shell and giving it a twist of about a quarter turn is an easy way to make sure the shells are nicely lined up. Finished macaron — sans feet! NEXT WEEK: More adventures in macaron baking! I test my first batch of chocolate macarons with chocolate ganache filling! Want to read more about baking macarons? Check out my book BAKING FRENCH MACARONS: A BEGINNER’S GUIDE.